Our artists work on printed canvas with generously applied acrylic paint, allowing them to achieve an artistic imitation of handmade acrylic paintings. 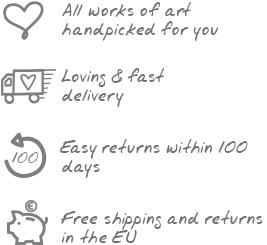 These hand painted art prints from KunstLoft are the affordable alternative to higher priced paintings for those of us who don’t have deep pockets. Their square formats provide a harmonious frame for delightful animal motifs, flower scenes or unique abstract designs. Cute bears wander home through the canvas. Owls with multi-coloured feathers present themselves in small picture format. Flowers in pastel colours come to life on the canvas. Colourful accents and details give the hand painted art prints a unique look that distinguishes them from conventional prints. Our artists create their artworks by hand with much love and a keen eye for details. The result: canvas paintings at reasonable prices, which will become a tasteful eye-catcher for your kitchen or office. In order to spice up your interior space with some interesting differences, you can combine handmade art prints with other art objects. Have a look at our collection and find inspiration from the diverse art scene that we offer. At KunstLoft you shall find a curated selection of handmade canvas painting in oil and acrylic paint, metal wall decor, free standing sculptures and handmade 3d frame art. At KunstLoft, individual artworks are often connected to other artworks with a similar motif, but each piece is always uniquely painted or sculpted by hand. Fine details and high quality paint make your handmade art prints a truly original work that simply cannot be mistaken with other pieces. Motifs that sparkle in a soothing simplicity are composed by our artists in cool colours, so your attention on the motif will not be distracted by an abundance of vibrant colours. Cool, however, does not mean boring in any way, since handmade acrylic paintings in turquoise possess a noble and captivating charm. These colours unfold their lure on a large format painting, which would be the ideal decoration for the empty wall behind the desk in your ultra modern law firm. The structures of the handpainted prints are traced with acrylic paints in order to imitate the look of handmade paintings. This style allows our artists highlight the details with all their subtleties and add colourful accents and adornments.